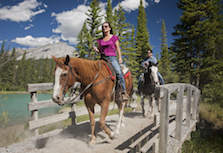 Horseback Riding, Trail Rides and Pack Trips in Banff National Park, Canadian Rockies. We are the exclusive horseback riding operator in Banff and the only outfitter in the Canadian Rockies with our own lodges and campsites inside the National Park. Please note that the trail to Sundance Lodge from the Cave and Basin is currently not accessible due to trail construction. Please use the alternate trail from the Healy Creek Trailhead.